The Federal Emergency Management Agency’s administrator urged county officials to arrange pre-event contracts for commodities ahead of disasters, instead of waiting for assistance that might not come. Brock Long, speaking at the National Association of Counties legislative conference in the nation’s capital last Tuesday, said FEMA’s contracting processes during 2017’s devastating hurricane and wildfire seasons were a “huge success.” The agency secured 1,973 contracts on top of 59 that were pre-event for water, meals ready to eat, debris removal, disaster cost recovery and other services. But in the event communities are cut off by a serious earthquake that cripples infrastructure, Long said, they may need to provide life-saving resources for 48 to 72 hours before the feds can backfill. Nearly 200 vendors braved uncertain weather conditions in Atlanta on Jan. 8, 2018 to participate in an event designed to assist vendors navigate the government’s policies and procedures for engaging in disaster recovery contracting activity. The event — dubbed “Before the Storm” — was sponsored by the Georgia Tech Procurement Assistance Center (GTPAC) and held at the Georgia Tech Hotel & Conference Center. Attendees at the Jan. 8, 2018 “Before the Storm” event learned about the importance of the National Response Framework. Attendees heard from officials of the Federal Emergency Management Agency (FEMA), the U.S. Public Health Service, and GTPAC’s counseling team. FEMA officials Annette Wright, Sammy Brunson, and Kyra Lee explained FEMA’s contracting protocols, including the important relationships with other federal, state and local agencies. Copies of all presentation materials used during the day’s event, plus internet links to important supplementary information, are now posted on GTPAC’s training page at: http://gtpac.org/training-video. U.S. Public Health Service’s Capt. Tom Bowman shared details of recent recovery efforts in the Virgin Islands. 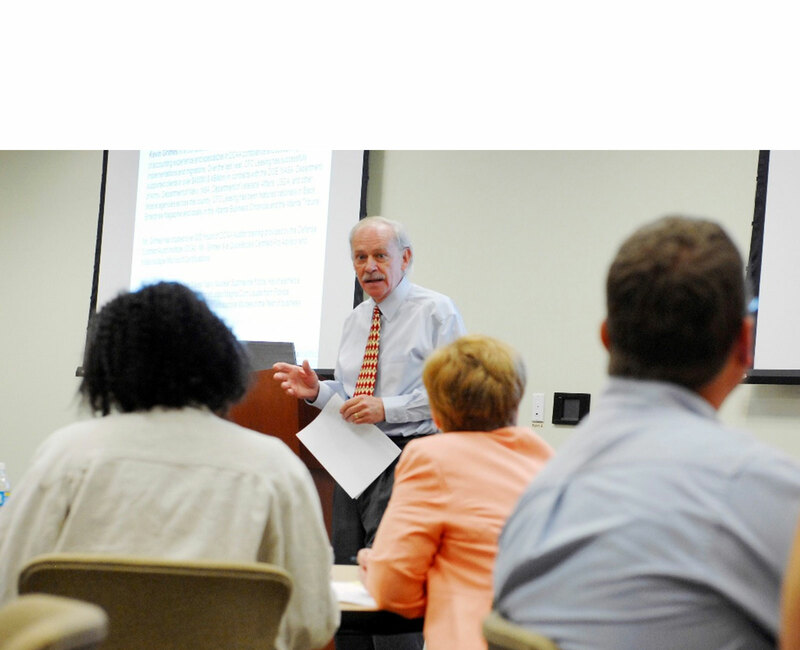 Break-out workshops were conducted in the afternoon on the topics of Subcontracting, Cybersecurity, GSA and Army Corps of Engineers, and Vendor Registrations. Attendees took advantage of free wi-fi during the event to visit on-line resources and take notes. Presenters told vendors to arrange, in advance of contracting, adequate lines of funding because of the likelihood of increased requirements and changed conditions. Disaster recovery contracts can be demanding — requiring 24/7 service — and require flexibility in the face of changing requirements. Too often, contractors fail because they have not adequately prepared themselves for these challenges. Speakers stressed that vendors must be prepared to be flexible in executing disaster recovery contracts. In addition to recommending that vendors familiarize themselves with the National Response Framework, speakers at the event told vendors to review the Stafford Act and FAR Part 18 which govern Emergency Acquisitions. If your company is interested in pursuing contract work with FEMA and other government agencies that respond to natural disaster and other national emergencies, register now to attend Georgia Tech’s “Before the Storm” event to be held Jan. 8, 2018 in Atlanta. Registration closes at Noon on Thursday, Jan. 4th. 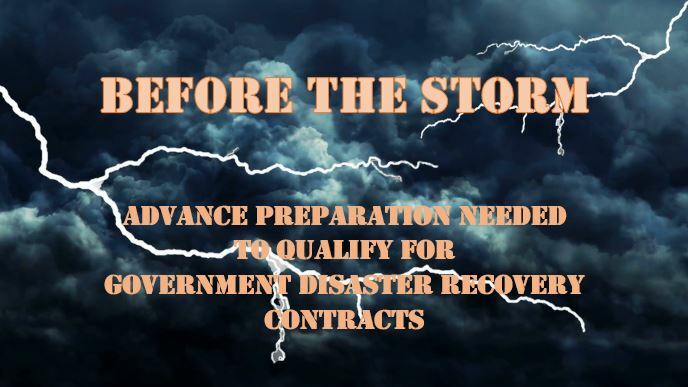 Organized by the Georgia Tech Procurement Assistance Center (GTPAC), “Before the Storm” focuses on the advance preparation vendors need to put in place in order to qualify for government emergency support contracts and subcontracts. By attending, vendors will learn how to become “procurement ready” well before agencies like FEMA need to purchase disaster recovery supplies and services. This event will be relevant to any vendor of supplies and services in any of the federal government’s 15 Emergency Support Function (ESF) categories. See ESF details at: https://www.fema.gov/media-library/assets/documents/25512. The day-long event will be held at the Georgia Tech Hotel and Conference Center in Atlanta, GA. There will be a registration fee of $30 to attend, and both breakfast and lunch are included. Advance registration for the event is required, and no on-site registration will be allowed. No refunds. The link to registration for the Jan. 8th event is: https://www.eventbrite.com/e/before-the-storm-tickets-40913664873. If you are traveling from outside metro Atlanta and need hotel accommodations, a block of rooms have been reserved until Dec. 22 at the Georgia Tech Hotel and Conference Center. Hotel details are provided at the link shown above. 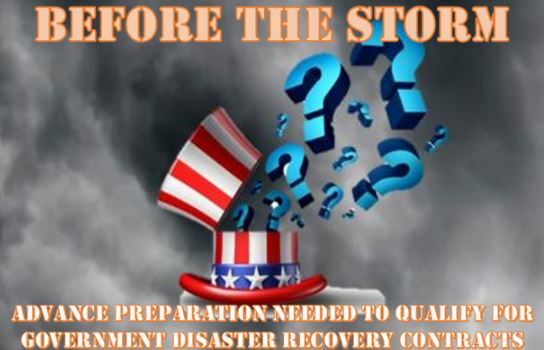 Organized by the Georgia Tech Procurement Assistance Center (GTPAC), the “Before the Storm” event will focus on the advance preparation vendors need to put in place in order to qualify for government emergency support contracts and subcontracts. Any vendor of supplies and services falling into any of the federal government’s 15 Emergency Support Function (ESF) categories should plan to attend. See ESF details at: https://www.fema.gov/media-library/assets/documents/25512. The day-long event will be held at the Georgia Tech Hotel and Conference Center. There will be a registration fee of $30 to attend, and both breakfast and lunch are included. The registration process will open in the next few days, so watch for an announcement. Registration is now open! There is a $30 registration fee, and both breakfast and lunch are included. Advance registration for the event is required, and no on-site registration will be allowed. No refunds. The link to registration for the Jan. 8th event is: https://www.eventbrite.com/e/before-the-storm-tickets-40913664873. As the old adage goes, when you want to find fraud, follow the money. In the aftermath of Hurricanes Harvey and Irma, the Federal Emergency Management Agency is preparing for another huge post-disaster recovery operation. As many as half a million Texans and untold millions of Floridians will likely be eligible for federal financial support. FEMA’s central challenge will be to balance the risk of fraud with the urgent need to provide relief. Post-disaster environments are notoriously prone to fraud. Most believe it is better to risk losing a few dollars to a fraudster than to make a true victim spend another night in a shelter. As the Government Accountability Office has reported, federal agency officials often decide to forego home inspections used to verify damage after a natural disaster because they may be prohibitively time-consuming or difficult to conduct in inaccessible areas. The last two major hurricanes to hit the United States—Katrina and Sandy—offered FEMA a wealth of lessons in how to manage the myriad fraud risks. 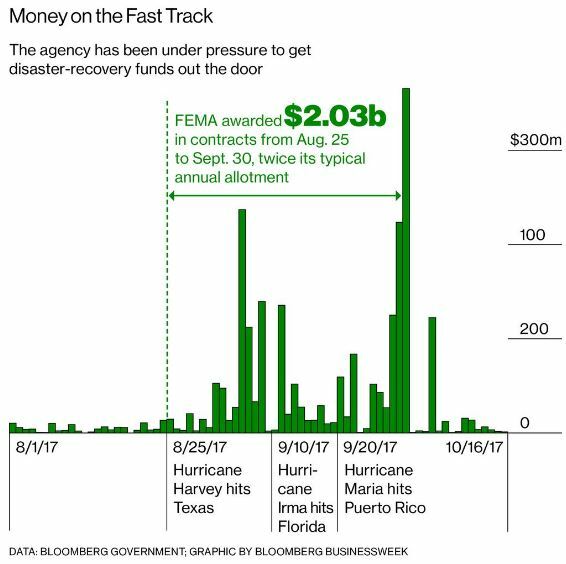 According to GAO, during the first six months following Hurricane Katrina in August 2005, FEMA provided between $600 million and $1.4 billion in improper and potentially fraudulent financial assistance.